Production: Paramount Pictures; black and white, 35mm; running time: 80 minutes, some sources list 82 minutes. Released 1935. Filmed in Paramount studios. Screenplay: Josef von Sternberg, adapted by John Dos Passos and S. K. Winston, from the novel The Woman and the Puppet by Pierre Louys; photography: Josef von Sternberg and Lucien Ballard; production designer: Hans Dreier; music and lyrics: Ralph Rainger and Leo Robin. Cast: Marlene Dietrich ( Concha Perez ); Cesar Romero ( Antonio Galvan ); Lionel Atwill ( Don Pasqual ); Edward Everett Horton ( Don Paquito ); Alison Skipworth ( Señora Perez ); Don Alvarado ( Morenito ); Morgan Wallace ( Dr. Mendez ); Tempe Pigott ( Tuerta ); Jil Dennett ( Maria ); Lawrence Grant ( Conductor ). Griffith, Richard, Marlene Dietrich—Image and Legend , New York, 1959. Josef von Sternberg: Dokumentation: Eine Darstellung , Mannheim, 1966. Weinberg, Herman G., Josef von Sternberg , Paris, 1966; as Josef von Sternberg: A Critical Study , New York, 1967. Kobal, John, Marlene Dietrich , New York, 1968. Dickens, Homer, The Films of Marlene Dietrich , New York, 1968. Silver, Charles, Marlene Dietrich , New York, 1974. Morley, Sheridan, Marlene Dietrich , London, 1976. Higham, Charles, Marlene: The Life of Marlene Dietrich , New York, 1977. Walker, Alexander, Dietrich , London, 1984. Wilson, George M., " Narration in Light ": Studies in Cinematic Point-of-View , Baltimore, 1986. Zucker, Carole, The Idea of the Image: Josef von Sternberg's Dietrich Films , Rutherford, 1988. Dietrich, Marlene, Ich bin, Gott sei dank, Berlinerin , Frankfurt, 1987; as My Life , London, 1989. Baxter, Peter, Just Watch! : Sternberg, Paramount and America , London, 1993. Bogdanovich, Peter, Who the Devil Made It , New York, 1997. New York Times , 4 May 1935. Variety (New York), 8 May 1935. "Creative Film Director," in Cue (New York), 14 December 1935. Dekobra, Maurice, "Comment Marlene Dietrich est devenue star," in Cinémonde (Paris), 16 April 1939. Knight, Arthur, "Marlene Dietrich," in Films in Review (New York), December 1954. Weinberg, Herman G., "The Lost Films: Part 1," in Sight and Sound (London), August 1962. Weinberg, Herman G., "Josef von Sternberg," in Film Heritage (Dayton, Ohio), Winter 1965. Green, O. O., "Six Films of Josef von Sternberg," in Movie (London), Summer 1965. Higham, Charles, "Dietrich in Sydney," in Sight and Sound (London), Winter 1965–66. Eisenschitz, Bernard, "L'Oeuvre de Josef von Sternberg," in Avant-Scène du Cinéma (Paris), March 1966. Bowser, Ellen, and Richard Griffith, in Film Notes , edited by Bowser, New York, 1969. Martineau, Barbara, "Thoughts on the Objectification of Women," in Take One (Montreal), November-December 1970. Flinn, Tom, "Joe, Where Are You?" in Velvet Light Trap (Madison, Wisconsin), Fall 1972. Rheuban, Joyce, "Josef von Sternberg: The Scientist and the Vamp," in Sight and Sound (London), Autumn 1973. Magny, Joel, in Téléciné (Paris), November 1976. Baxter, P., "On the Naked Thighs of Miss Dietrich," in Wide Angle (Baltimore), vol. 2, no. 2, 1978. Combs, Richard, in Monthly Film Bulletin (London), May 1978. Tessier, Max, in Revue du Cinéma (Paris), July-August 1985. Thomas, François, in Positif (Paris), January 1986. Listener (London), 7 January 1988. Jenkinson, P., "Sternberg's Last Interview," in Film Culture (New York), June 1992. Koch, Gertrude, and M. Gerber, "Dietrich's Destiny: Strike a Pose," in Sight & Sound (London), September 1992. Morgan, M., "Sternberg & Dietrich Revisited," in Bright Lights (Cincinnati), July 1993. The Devil Is a Woman is the final film starring Marlene Dietrich made by director Josef von Sternberg. The identifying characteristics of the von Sternberg/Dietrich collaboration, including the ambiguity, often difficult for viewers to accept, are evident here. The Devil Is a Woman is a perfect culmination to an enigmatic relationship and a breathtaking series of visually stunning films. Based on Pierre Louys's novel, The Woman and the Puppet , the film is a quintessential example of the von Sternberg filmed universe. To follow the story is to travel through a narrative labyrinth, following the many changes of mood, mind, character and costume of the central character, Concha (Dietrich), the devilish woman of the title. The contradictory Concha is all surface and no depth, a beautiful, fickle, unpredictable woman, or at least that is how she is presented as Don Pasqual (Lionel Atwill) tells Antonio (Cesar Romero) about her. Concha exists at the center of the film, and von Sternberg favors the audience with as few fulfilled expectations and explanations as she has favored her lovers. At the end, Concha (through von Sternberg) has demonstrated the same cruel control over viewers as she has over her lovers, leaving an audience with nothing to grasp, much less to embrace or understand. The Devil Is a Woman defines the von Sternberg approach to cinema, which is unique. As a film artist, he defies the conceptions most have about what film is or what it can or should do. He seldom develops a logical narrative pattern, with ordinary character motivations. On the contrary, a von Sternberg character frequently makes an abrupt shift that, in literary terms, is unexpected and unjustified. "I changed my mind," Concha offers as an explanation when she turns back across the border to rejoin her rejected former lover. This arbitrary change of mind is the essence of the von Sternberg film, which forces viewers to realize that the act of seeing is itself the truest meaning of the film. By removing conventional forms of dramatic tension, character development and plot motivation, he asks viewers to accept the things that usually supplement a film story as if they were the story themselves. In never fully explaining Concha, he seduces viewers into observing her more and more closely. The Devil Is a Woman presents an illusionary world, filled with irony, mockery, androgyny, and a certain amount of implied decadence. As is true of all his films with Dietrich, it is somewhat of a von Sternberg autobiography, with Atwill, a von Sternberg look-alike, playing the character who is toyed with by Concha. The relationship of these two characters is a complicated interplay of master and victim, puppet and manipulator, with no clear indication of which is truly the master and which the puppet. With The Devil Is a Woman , von Sternberg worked against the tradition of Hollywood in the 1930s, in that he reduced narrative tension to a state in which very little seemed to be happening. "The best source for a story," he said, "is an anecdote." 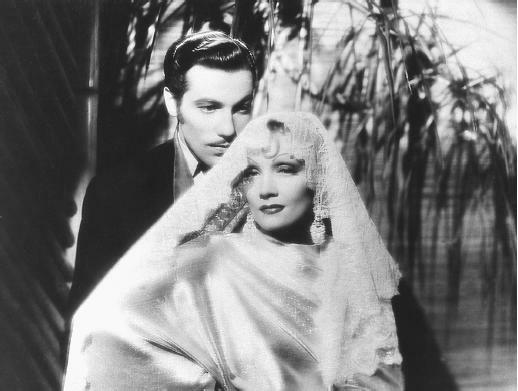 Although The Devil Is a Woman is based on a famous novel, von Sternberg liked trivial plots, and never took up great social or political themes. This led to an inevitable rejection of von Sternberg by both critics and audiences, and The Devil Is a Woman was a failure. Seen today, it is a stunning example of pictorial beauty. The use of light and shadow in intricate interplay, the long takes connected by luxuriously slow dissolves, the ironic music, the elegant compositions, and the complicated, layered images make it the work of a major visual artist. I just saw the film as part of my Marlene Dietrich collection & I agree with the evaluation of the movie...but I really liked it in every aspect eventho there was not much of a story.